...and many private weddings & parties! "DJ MicDrop was professional, courteous, and prompt. Everyone at our Christmas event had a wonderful time. I would recommend him to anyone who needs a DJ for a corporate event in the future." "Great experience for my non-profit agency event. Would highly recommend this DJ!" "Nate was great at our event! our event did not go as planned, but he still made the best of it and we really appreciated that!" "Nate did an awesome job at the Findlay Area Christian Prom engaging students and being an awesome representative! I would definitely recommend him for DJ events." "DJ MicDrop was PERFECT for our hip-hop BBQ surprise party for my husbands 40th! (Pictured right) He was so easy to work with and accommodating to our needs and budget! All of our guests were pleased and impressed with his variety of tunes and fun but professionalism throughout the day and evening! Thanks Nate! You Rock!" "Wow! Nate has an amazing heart for community. What a fantastic evening we all had at ComeTogether18 youth summer kick-off. If I could rate higher I sure would..the music selection, lighting, & the sound quality was excellent! ⭐️⭐️⭐️⭐️⭐️ Nate, Thank you for bringing so much quality & excellence to our event!!" 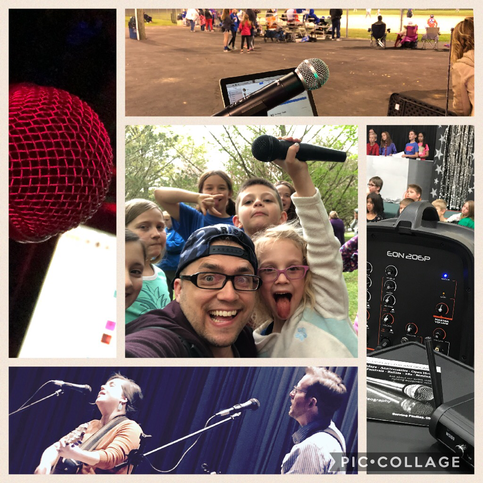 "Nate DJed for the Lincoln Spring Fling and did a great job with music and keeping the kids moving with his song choices and dance off! Without him and his music it wouldn't have been the same!" "If I could rate higher I would!! We hired MicDrop for a very large school event this evening and Nate rocked it 120%!!!! Very engaging with the crowd, great selection of music and he even coordinated a dance-off! Overall we couldn't be happier!!!" "Nate provided music, lights, and sound equipment for a recent outdoor baseball preview night event. The music was well chosen and was enjoyed by both parents and kids! Nate really provided a fun and upbeat environment for the night! I highly recommend that you contact him for your next event! He's a great guy to work with." ​"Nate brought us equipment for our sorority formal that we needed last minute. He set everything up and tore everything down for us at a very reasonable price especially on short notice! I would highly recommend him to anyone needing a DJ or just sound equipment." "Thanks for playing at Children's mentoring connection Shoot for the Stars event!!!" "Very friendly and super easy to work with!" high school homecoming dance was great! "Nate arrived on time and was very professional. Our event did not go as planned, but he still made the best of it for us and we really appreciated that." Nate and MicDrop did a fantastic job with the sound and music at our charity event last April. He had a great mix of music and was totally willing to work with us to match the music to the occasion and to the preferences of the people in attendance. Nate was courteous, professional and a great guy to work with. I highly recommend him and MicDrop for your next event. 5 STAR DJ. Nate DJ’d a family birthday I attended. The kids and parents had a great time. DJ Nate, mother approved & a great value. NATE, YOU ROCK!!! Nathan is an amazing individual who knows how to be a blessing to others in the technical area. He explains, coaches and tests things thoroughly and offers great suggestions! Love his Heart as he serves in excellence!!!! Nate went above and beyond the norm setting up the sound system for our event in downtown Findlay! His equipment ran for the entire 90 hours perfectly! Nate is wonderful to work with and I whole heartedly recommend his new business! "Nate was a great addition to our daughter’s graduation party! (Pictured left) Everyone loved dancing and he played fun music that kept the party rolling! Thanks Nate!" "Nate did an amazing job! Highly recommend, will work with him again!!!" "Nate is very professional and has a lot of creative ideas and technical knowledge. His choice of music was very good. The lights added a fun atmosphere for our event. The wireless microphone allowed everyone to participate in a group game and everyone could be heard easily. That made a huge difference in the success of this event. I really appreciate the video he made that has some still shots and some video. It is very well done. Thank you Nate." "After organizing and setting up a large event, MicDrop came in and took my event to the next level! Without the sound and the lights that MicDrop provided, our event would of have been considered typical." The new year's eve game party MicDrop played at was great! MicDrop did an amazing job with accompanying the party with Christian rock music that was the perfect fit for the setting and was still fun for adults and kids. It made the new year's eve party experience even more exciting with the colorful lights, the kids enjoyed dancing and watching the lights on the gymnasium walls. It made the holiday night relaxing and fun without having to worry about keeping the music going or appropriate type of music at our church event. Thanks so much MicDrop Productions! "Nate did an excellent job making sure that everything ran smoothly during my wedding reception. I would definitely recommend him to friends." "This was a great experience. Nate was here on time and had things set up in my backyard. He played a nice selection of songs during the Fourth of July party. He stayed late to get everything packed up after the party." "Nate did an excellent job at our wedding reception. He took the time to get to know us prior to the reception, so his song choices were spot on. He interacted really well with the guests and by the end of the night it was like having another friend there with us. If I ever need him for another event, I wouldn't hesitate to give him a call! Thanks, Nate!" "He was amazing! He showed up early to insure he was set up. Definitely would recommend." "I just wanted to say DJ MicDrop did an amazing job at our wedding even on a last min notice. He dropped everything he was doing to make sure our wedding was what we wanted. His performance was awesome! Highly recomended! Thanks Micdrop Productions." Hey everyone, I’m so happy I went with Nate/MicDrop Productions. He did a wonderful job and he knew what he was doing. I didn’t have to worry about anything. He kept my guest entertained and knew how to do some nice lighting and had a great song collection that played and very kid and family friendly! Give him a chance and I promise you he won’t let you down ohhh and he’s affordable and willing to work with you and also very informative about his prices and what he’s got to offer you on your big day! My husband and I are very happy that we chose Nate/MicDrop Productions, he’s great! We love you, Nate! "It was rather short notice for us to ask Nate to help, but he pulled it together and did a great job in such a short amount of time!! If you're looking for a great DJ I recommend Nate! We called and he got everything to our church and he had it set up within 24 hours! Thanks for not only making our wedding day special, but for being a part of it as well!" "Micdrop productions was amazing at the wedding! He played amazing music and was so easy to work with along with being organized. The dance floor was full the entire time because of the energy he created! " Thank you for your 4 or 5 Star ratings and positive feedback through any of my above websites!